Woodworking has always been a big part of the work going on at The MakerBarn, but now we are seeing more metal projects being built. 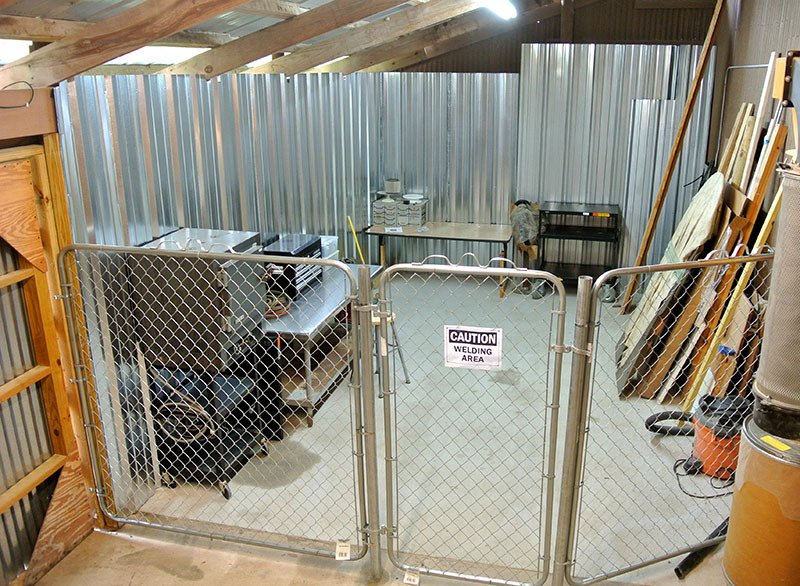 With the completion of the machine shop, addition of powder coating, and the near completion of the welding shop, expect to see even more heavy iron at The MakerBarn in the near future. Jody Cochran is powder coating a small weldment used on the new miter saw table being built by Kyle Fraczek. It’s just a large washer with a 1/2″ nut welded in, but you could never find one at the hardware store. 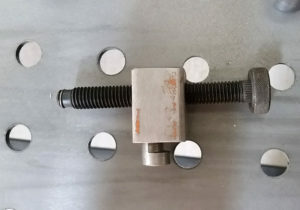 It’s used for mounting the feet on the large cabinet. Rob Nixon made this super dial indicator holder for the lathe. Made from 6061 aluminum, brass, and steel, it should last a lifetime. 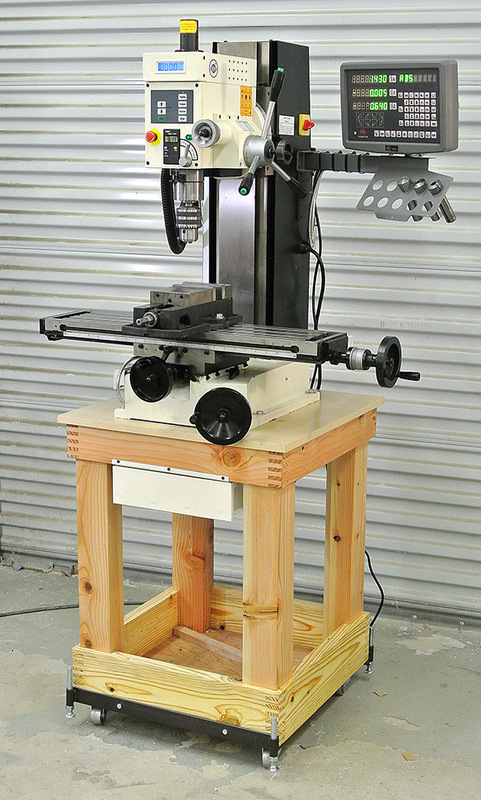 This is a special quick-clamp designed for the new welding table. 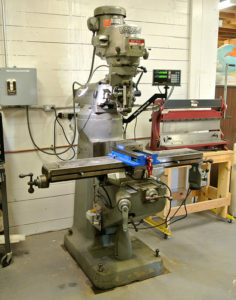 It is a good example of offset turning on the metal lathe. Judging from the orange power coat paint, the steel was probably left over from a Harbor Freight project. Just some scrap from the junk box, now it’s a handy tool. The welding and fabrication area is almost ready. The area is located in the South-East corner of the barn. It is about 14×20 feet, not real big, but should do well for our purposes. We covered the outside walls with steel panels, which assures there is no exposed wood in the shop. A six-foot high fence with a gate was built to control access to the area. An exhaust fan will be installed on the far wall to provide good air exchange. The area has it’s own electrical sub-panel, so installing power for welding machines should be easy. A bit more relocating the material on the west wall, and we should be able to start setting up equipment. We a very nice oxy-acetylene rig and also some equipment that members are willing to loan to get us going. 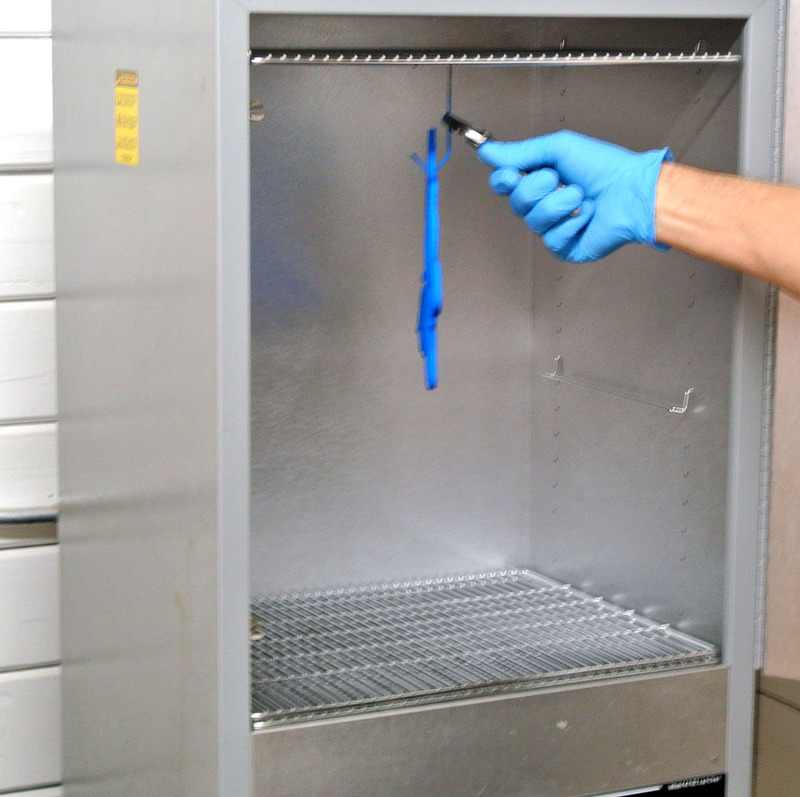 With the completion of the downdraft table/powder coating booth, and the acquisition of a new oven, we now have the facility to do powder coating. 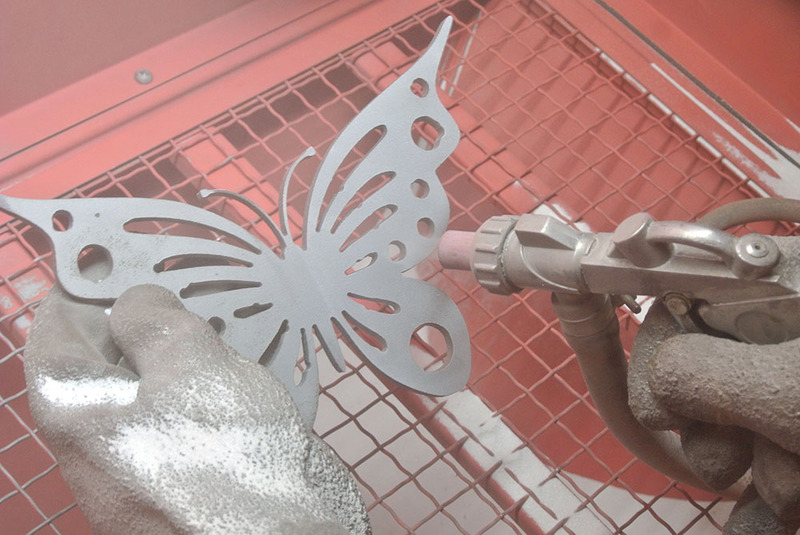 Powder coating is a process where a dry powder-like paint is applied to a metal piece using electrostatic attraction. The piece is then baked in an oven, causing the powder to melt then polymerize into a very durable coating. Here’s an example. 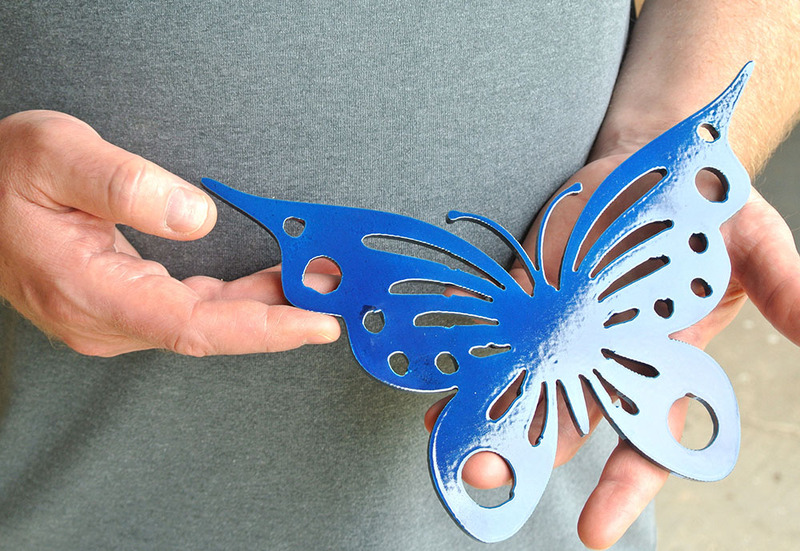 This is a butterfly cut from a piece of 1/4″ steel using a plasma cutter. 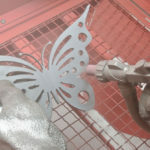 The butterfly was cleaned and then blasted in the abrasive blaster to remove the mill scale and give a nice even surface for the power coating to adhere to. After this point in the process you should use gloves to protect the clean object from oils on your skin. 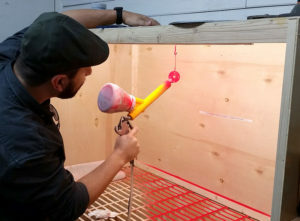 Oils on the surface of the part are not good for the powder coating. The powder is then poured into the container for the gun. The powder has the consistency of no-sift flour. 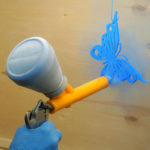 It is a good idea to do this in the spray booth with the fan running. This will help contain any spills that may occur. Using air, the powder is blown unto the steel part. 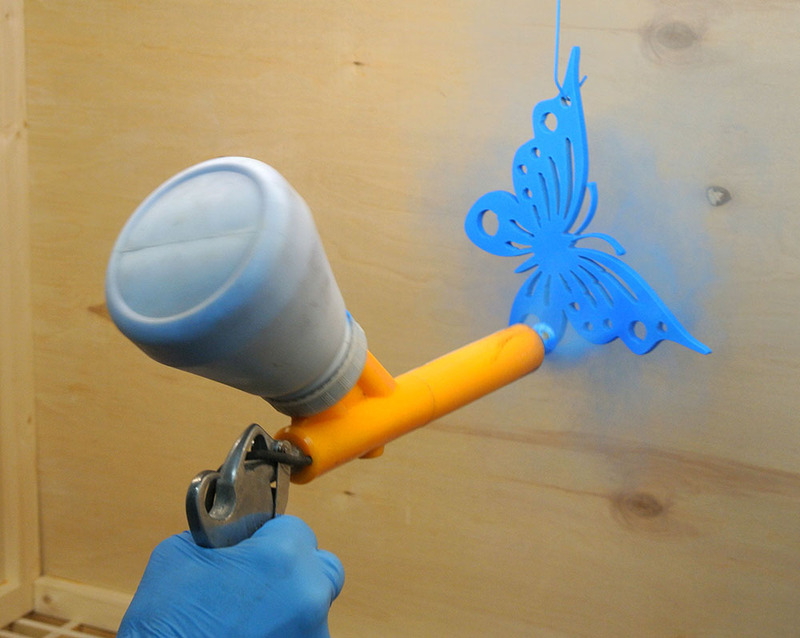 There are small electrodes on the spray gun that give the powder an electrostatic charge. The object being coated is grounded, which causes the powder to be attracted to the part. Sometimes it can be difficult to get the powder into small areas. Shaking the gun a bit can help produce a heavier blast to these areas, getting past the small “force field” that occurs. After thoroughly coating the part, it is hung in the oven to bake at 380 degrees for 20 minutes. A fter removing the object from the oven and allowing it to cool, the finish is completely cured. No solvents are used in this process, so there is no smell or disposal of hazardous solvents. In this example, a blue high-gloss coating was used. There are hundreds of colors and finish types available. 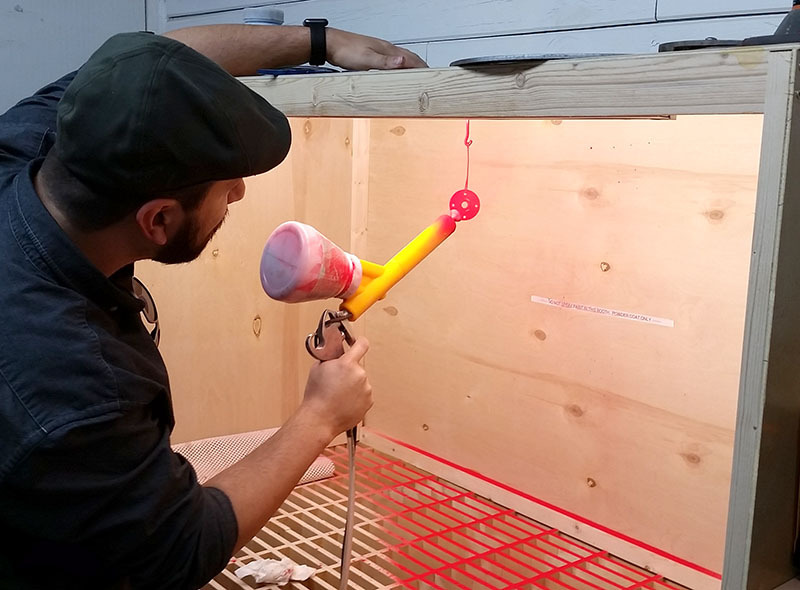 eBay is a good place to shop for various types of powder coating supplies. 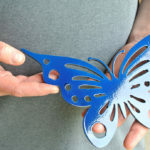 Almost any metal object can be powder coated. Keep in mind that the 380 degree oven can melt plastic, char wood, and destroy rare-earth magnets. 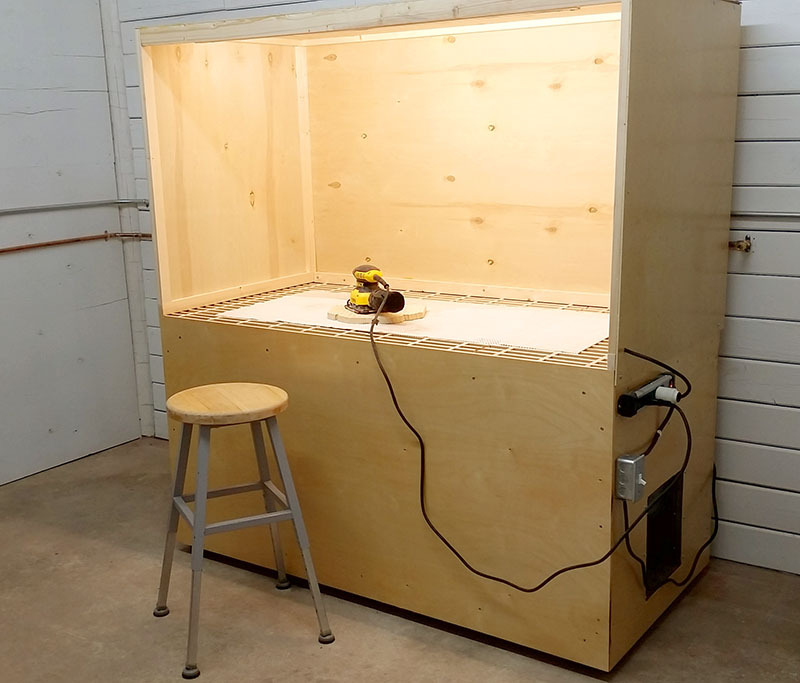 A new Downdraft Sanding Table was built in The MakerBarn. The table has a large squirrel-cage blower from a 5 ton whole-house air conditioning/heating unit. The blower pulls air down through the table top, filters the air with a two-stage filter, and blows it back into the room. The unit moves a lot of air, and can be used for cleaning the air in the finishing room while using the stationary sanders. 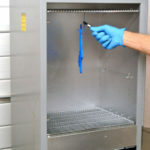 The hood allows the unit to also serve as a powder-coating spray booth. The unit is 60″ wide, 30″ deep, and 65″ high. It was built using pre-finished birch plywood. This is the same type of material used by cabinet makers for internal shelves on kitchen cabinets. It has a tough epoxy finish that is easy to keep clean. The table top is a grid made from the same plywood. There were over 400 dado cuts made to produce the egg-crate style grid. A four foot LED lighting fixture makes the booth bright and easy to work with. The entire unit was designed and constructed in The MakerBarn. This machine will help open new possibilities for makers at The MakerBarn. The machine is in excellent condition. It has a 48″ table with movements of 36 x 12 inches. The Sony digital readout has a resolution of 0.0002 inches for very high precision. Installing the machine was easy, except it did need quite a bit of cleaning. It is now up and running so come visit and see what can be done. 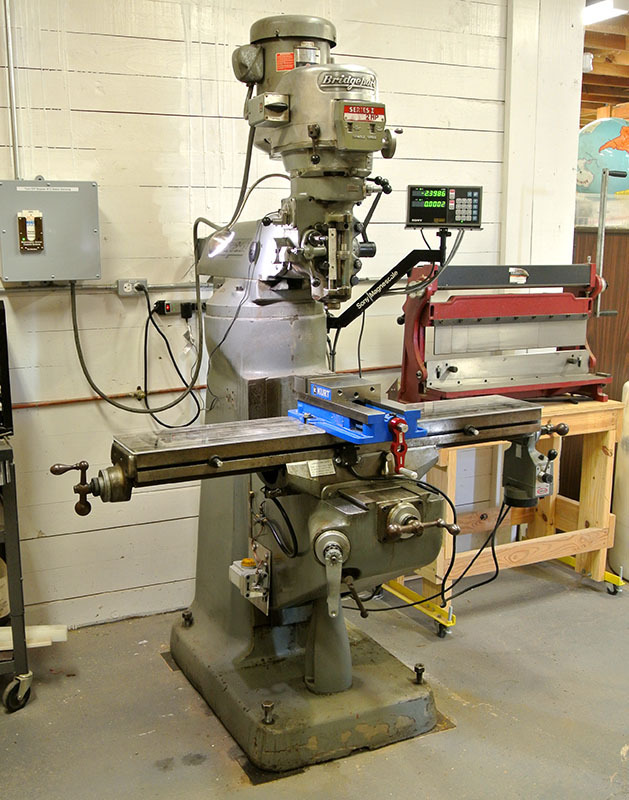 Instruction on the machine will be on a one on one basis making a small project to help familiarize the maker with basic metalworking methods. 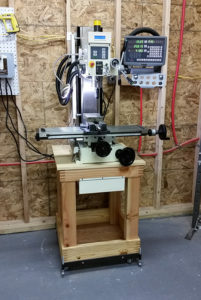 Today Greg and I extended the dust collection system and connected it to the belt sander and the router table. The sander is awesome. 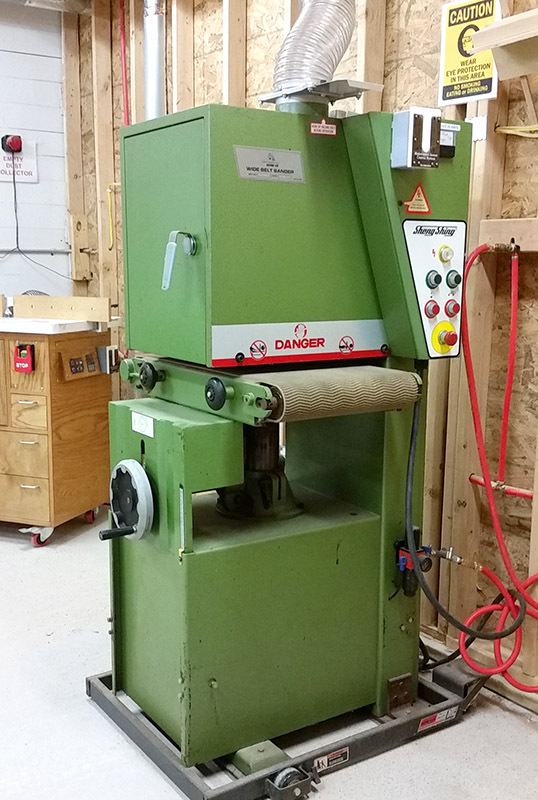 We currently have 80 grit belts for fast stock removal, and several other grits up to 220 for finish sanding. The machine is somewhat complex to operate, but still not hard to learn. If you want to get qualified, let me know. We will be changing the V-belts and adding automatic controls for the air supply, but the machine can be run right now. We are always trying to improve The MakerBarn, adding new tools and materials. 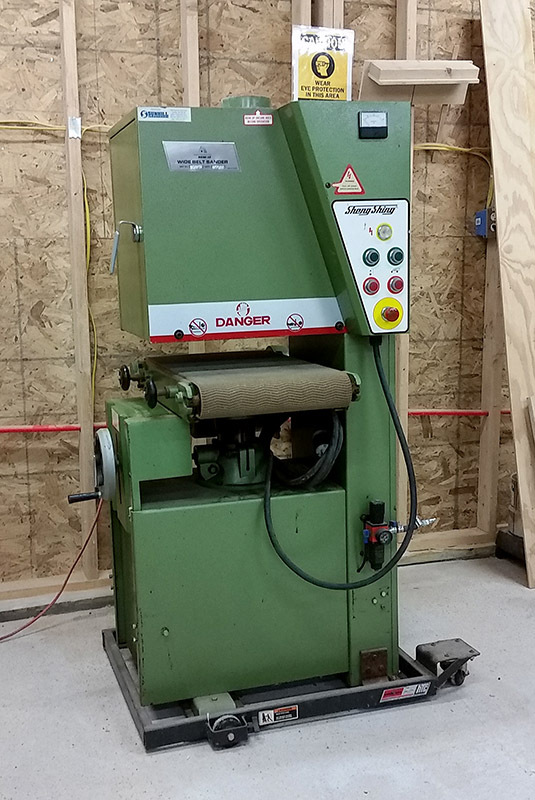 Recently we had a very generous donation of a Sheng Shing SDM-15 wide belt sander. This machine uses a 5HP motor to power the 16×48″ sanding belt. The belt oscillates back and forth, which helps lengthen belt life and avoid streaking the wood being sanded. It can sand a 15″ wide swath, but being open ended on one side, the operator can rotate his panel and sand a piece 30″ wide! The machine weighs about 800 pounds and is very solid. When we received the machine is was complete, no missing parts. It even came with two copies of the manual. The machine was built in October 1996, so we just missed its 20th birthday. The sander was also in good condition except that all the internal pneumatic tubes had disintegrated. Not a single line could be found, they had all turned to dust. The pneumatic system is somewhat complex since it operates the belt tensioning, belt oscillation, and the emergency motor brake. Information in the manual was sketchy, but I was able to re-plumb the pneumatics and now they work as they should. The machine runs well. Unfortunately, after a few minutes of running, the sanding belt broke. Not an unexpected event, since the belt was probably many years old. I’ve ordered new belts in several different grits, so we should be in good shape. What’s next? I need to install a MACS system and a main power switch. Strangely, the machine was never built with a main power switch. We may want to change the two V belts at some time, but for now they should work. Within a week the machine should be ready for use by the members. The Sieg Super X3 is now at The MakerBarn. It has a longitudinal travel of 17″, crossfeed of 5.75″ and the head can be moved 15″. All three of these movements are displayed on the DRO. The quill has a travel of 2.75″ and has its own digital readout. We should be able to do some very precise work on this machine. What’s your first project going to be? Soon I’ll post a shopping list for those expendable tools each member may want to buy. 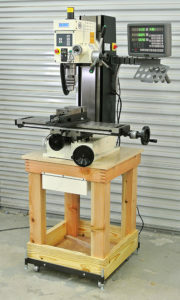 The shop will provide clamp-kits, vises, chucks, collets, and other larger items. The Digital Readout system has been installed and the mill is ready for action. 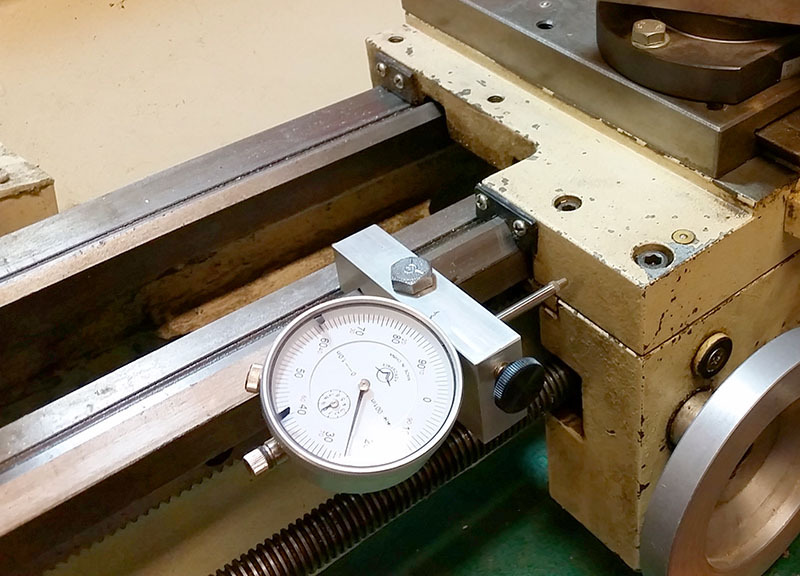 In my opinion, no milling machine should be without a digital readout (DRO). If you ever had to use an old machine without a DRO, you would be amazed that anyone could produce good results. Counting turns of the handle, reading tiny numbers on dials, making sure all movements were from the same direction, and having to compensate for lead-screw wear; none of this is necessary if the machine has a DRO. 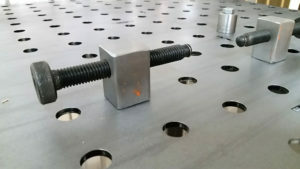 There several different technologies used to build the linear scale used to determine machine position. The DRO on our mill uses high precision glass scales. Inside the scale housing (spar) is a long strip of glass. The glass was coated with a fine layer of chromium, then fine lines were etched in the chrome as many as 50 per mm. The reader module, which is attached to the spar, slides along the glass scale. The circuitry inside the reader module shines light through the glass scale and using a pair of light sensitive detectors can “read” the glass scale and output pulses to the display unit. The display unit counts the pulses to determine location. The small computer within the display unit can provide many different ways to use the position data. These functions are beyond the scope of this blog. The machine should be ready for installing in The MakerBarn sometime this next week. Look for upcoming classes in machine operation and certification.